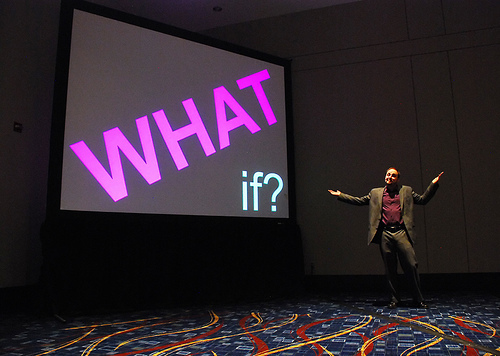 « What If… you could jump-start your shop’s 2012 business? What If… you fine-tuned your incoming procedures? you thought of your consignment, resale, or thrift shop just a little differently in 2012? Would your shop be more successful? More fun to run? Would you find unexpected supporters and fervid fans if you just approached things a tiny bit differently? This week we’ll present a few What Ifs for you to consider. And what if you took the kernel of one of my what ifs and modified it for your business? What if my idea, and your interpretation, and someone else’s version combined… can you see where this is going? What if you dared to be greater than you already are? Processing incoming merchandise can be a business-killing bottleneck. The most productive shops have systems to ensure their sales floor is full of fresh new items without detracting from their sales activities and without sacrificing their patience, good humor or family life. Accept when your suppliers can come in, not when it’s convenient for you. Give your suppliers what they want: a quick, easy, convenient way to bring items in. Don’t waste time ondecisions. Mulling over the price of a t-shirt for 10 minutes can mean the next consignor (the one with the designer bags) decides the wait is too long. Arrange your acceptance area for efficiency. Having to shift goods, dig out forms or even your computer, or tripping over hangers will slow you down. Spending five minutes too long on each batch can mean a full wasted day a week. Don’t lose time on mistakes. Lost a whole batch? Whose items are those? Where are the tags for these? Where are the things for these tags? You know what I mean. Develop a system that works and stick to it. Don’t perform tasks less-experienced people could do. Design a way to handle overflows. Consider a variety of possibilities, from a “free-for-all” day to a Drop-&-Run system. You may be killing yourself trying to fulfill expectations you think your suppliers have without realizing that they might be delighted with an alternative. Imagine what you could do if your intake structure reflected your desire to grow your business. There’s more What if‘s all this week… look forward and back. Should you give prices for all the clothing on the spot or how should this be handled? im just opening a consignmnet shop , so there would be some brand pricepoints i wouldnt be familair with ? Many shops consider this impossible. But somehow, for 20 years and over 20,000 consignors, I and my manager did this without fail. And the business supported not only me, but the manager who bought it from me, and many well-paid staffers. Sure, there will always be brands you’re not up on, but being able to spot quality as well as the more obvious condition and style, goes 90% of the way to valuing goods; you can always increase the price if you later find out you’ve underestimated (changing a price downward though, wouldn’t be cricket). I strongly suggest that itemized, priced receipts for incoming consignments is worth, in terms of the longetivity, profit, and ease of operation, the effort to structure your business in this way. We’re a small women’s clothing shop (1,200 sq.ft.) so were very limited on space. We’ve been open for 11 years now and we were profitable the first year. We have tested several intake systems over the years and for the last two years we think we have finally found the best system for us. We’re open every day and we accept consignments every day without appointments. We also have a 25 item limit per visit and we use a drop and run system exclusively. While we are limiting the consignors to 25 items, we are “rewarding” them by not requiring an appointment. At first we had some reservations about the item limit but what we have found is that consignors bring in higher quality items instead of just dumping their entire closet on our counter. And,as I said, we’re a small shop and there’s simply no way we could handle hundreds of items from numerous consignors throughout the day. The consignors love the fact that they can come in on THEIR schedule and we’ve never had a complaint about the item limit. The system also allows us to service shoppers quickly because everything is drop and run and were not inspecting items while customers wait for service. So, that’s what has worked for use for the last two years! I agree 100% with Kate. We are open Monday thru Saturday 10 to 6, and we accept items Monday thru Saturday from 10 to 6. We do not have a limit on the amount of items we accept, although we are selective. We have almost 12,000 square feet of space so we are not a small shop. We have been overwhelmed with receiving at times, but I have found the key to staying on top of it is good organization and a good staff. When I first opened, I accepted consignments at any time but now I changed it to Mon thru Thurs without an appointment and Fri and Sat by appt only. This new arrangement is working very well and allows us more time to work with customers on our busy days. I always encourage the consignor to “look around” while I’m going through their items. I rarely do “drop and run” because I want them to hang out for a while and shop while I’m going through the items. Some of my best customers are also consignors! We used to accept consignments every day. We were so slammed with intake that we didn’t have time to interact with our buyers. What has help us with the intake has been accepting up to 10 items every Monday & Wednesday or by appointment. We try to fit in as many appointments as possible at the same time. We have found that most of our consignors don’t mind. We explain that if we limit the amount of items 2x week that their items get on the sales floor quickly. The consignors feel special knowing that we want to get their items out so they will sell and buyers/consignors see new items coming in on a regular basis. We also just started accepting prom consignment. We have the intake area out where the consignor and buyer can see them. You never know… that consignor may be a buyer while we are processing their dresses. But I find it intriguing that you have overlooked your own insight in your last sentence: “that consignor may be a buyer while we are processing”. Your structure of making it less likely that consignors will be in your shop might well be limiting your sales totals, your traffic, and your WOM. Just a thought. Not trying to run your business for you or suggest that your viewpoint isn’t right for your shop. Just nudging those listening in on our exchange to think about “what if?” I think that the beginning of a new year is always prime time to try to truly re-imagine fresh ways of doing things in order to achieve whatever goals we choose. Again, thanks for commenting, and hope prom-time is great for you! From a ReSell*RePlace*ReJOICE! standpoint, single-use stuff like prom dresses is SO important.